We cover many emerging markets in the startup ecosystem. We previously published posts that summarized Financial Technology, Internet of Things, Bitcoin, MarTech, Artificial Intelligence, Retail Technology, and Connected Transportation in six visuals. This week, we do the same with Health Technology. At this time, we are tracking 863 Health Technology companies across 23 categories, with a combined funding amount of $15.5B. To see all of our Health Tech related posts, click here! 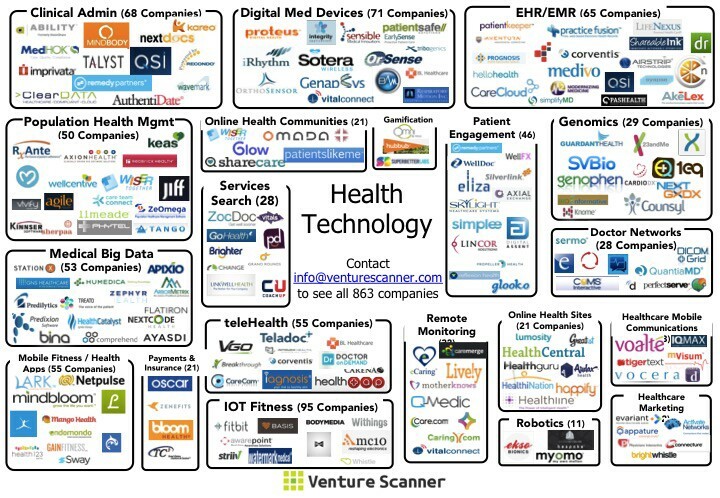 Market Overview: Breakdown of Health Technology into categories. Number of Companies Per Category: Bar graph summarizing the number of companies in each Health Technology category. 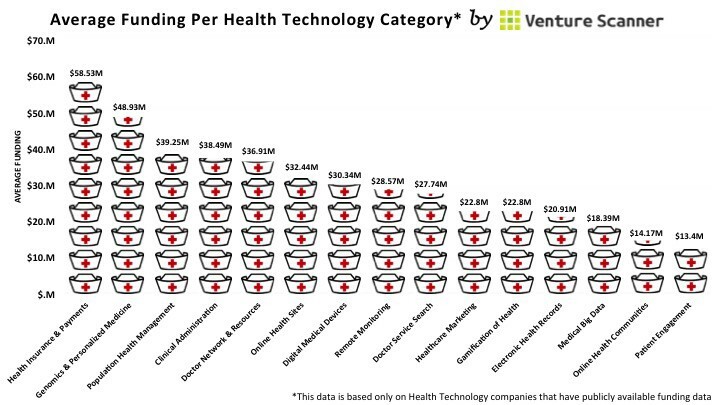 Average Funding By Category: Bar graph summarizing average company funding per Health Technology category. Venture Funding in Health Technology: Graph comparing total venture funding in Health Technology to the number of companies in each category. 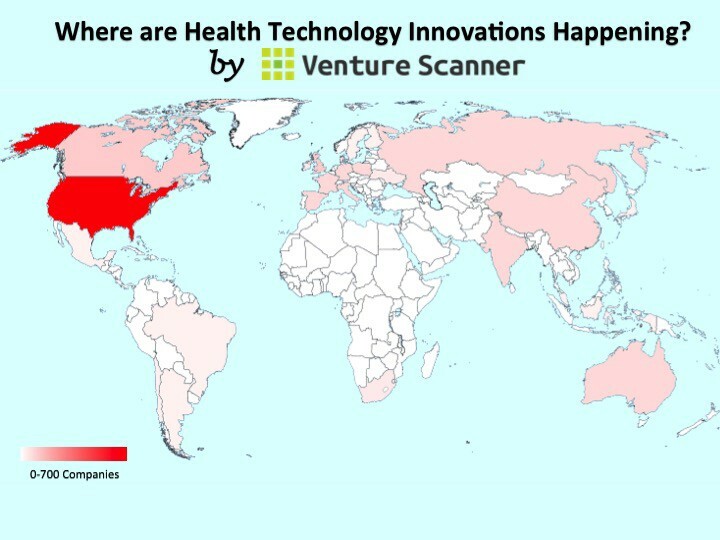 Global Breakdown of Health Technology: Heat map indicating where Health Technology companies exist. Median Age of Health Technology Categories: Bar graph of each Health Technology category by median age. This sector covers companies that combine IT with healthcare to enhance well-being. This includes digital technologies and services such as mobile connectivity, biometric sensors, cloud computing, social networking, robotics, etc. that are affecting all fronts of healthcare such as hospital management, doctor-patient relationships, peer-to-peer support groups, and personal fitness. Below you’ll find our Health Tech sector map as well as the categorical breakdown of the sector. Clinical Administration and Backend: Services that foster management of administrative tasks such as scheduling, patient transfers, billing, compliance, etc. Digital Medical Devices & Diagnostics: New generation of IT-enabled medical devices and diagnostic tools for use by doctors and other clinical staff. Population Health Management: Services to manage healthcare issues for groups of people such as corporate employees. Genomics and Personalized Medicine: Services that utilize human genome data for analytics, disease prevention, and the like. Electronic Health/Medical Records: Services that create or manage EHR/EMR (Electronic Health/Medical Records) to improve efficiency/effectiveness of medical practice. Doctor Network and Resources: Social services that allow doctors to connect with each other to get in dialogue and/or access their expertise. Medical Big Data: Big data and analytics for medical applications. IoT Health Care: Internet of Things (IoT) focused on consumer and/or at-home health care solutions. Doctor and Healthcare Service Search: Services that allow patients to search for doctors, healthcare plans, and other healthcare services. Remote Monitoring and Family Care Management: Services that allow families and medical professionals to monitor and manage those in care (ie. senior citizens). teleHealth: Services that allow remote treatment and/or consultation between doctors and patients. Online Health Destination Sites: Websites providing health-related information and resources. Health Insurance and Payments: Health insurance exchanges, benefits and patient payment management platforms focused on providing more efficient workflow and greater transparency. Patient Engagement and Education: Services and platforms such as In-Hospital multimedia systems and patient relationship management services. Mobile Fitness/Health Apps: Mobile apps that keep track of fitness activities, provide health resources, training programs, etc. IoT Fitness: Internet of Things (IoT) focused on personal fitness and wellness solutions. Online Health Communities: Social services among patient groups and medical professionals. Healthcare Marketing and Campaign Management: Services for hospitals, insurance agencies, and other healthcare services to identify and target potential customers. Healthcare Mobile Communications/Messaging: Mobile communications services dedicated for hospital use by doctors, nurses, etc. Gamification of Health: Application of game elements to promote behavior-changing health and wellness. Healthcare Robotics: Robotics application for healthcare such as prosthetics, remote treatment, etc. Healthcare Startup Incubators and Accelerators: Investor programs that fund and support Digital Health startups. 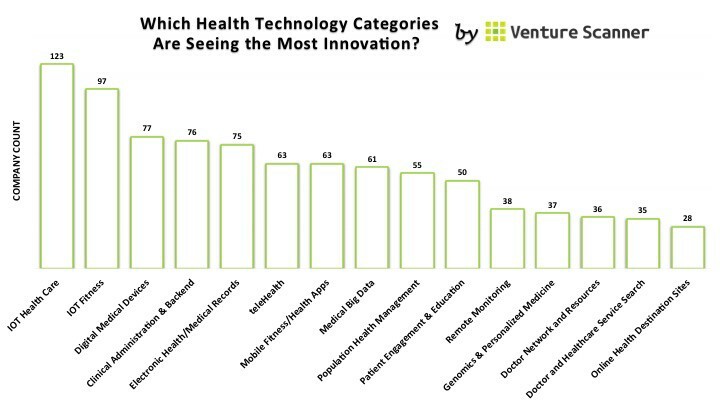 The bar graph above summarizes the number of companies in each Health Technology category to show which are dominating the current market. Currently, the “IoT Health Care” category is leading the way with a total of 123 companies, followed by “IoT Fitness” with 97 companies. 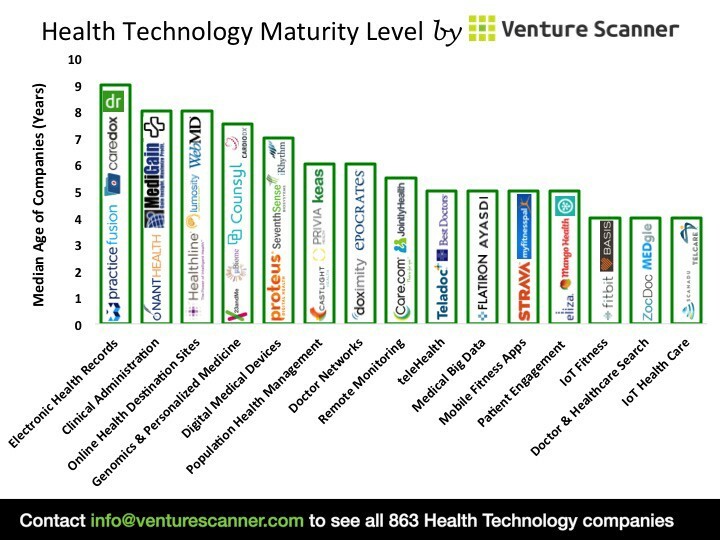 The bar graph above summarizes the average company funding per Health Technology category. The “Health Insurance/Payments” category leads the way with an average of $58.5M per funded company. The Health Insurance/Payments category includes health insurance exchanges, benefits and patient payment management platforms focused on providing more efficient workflow and greater transparency. 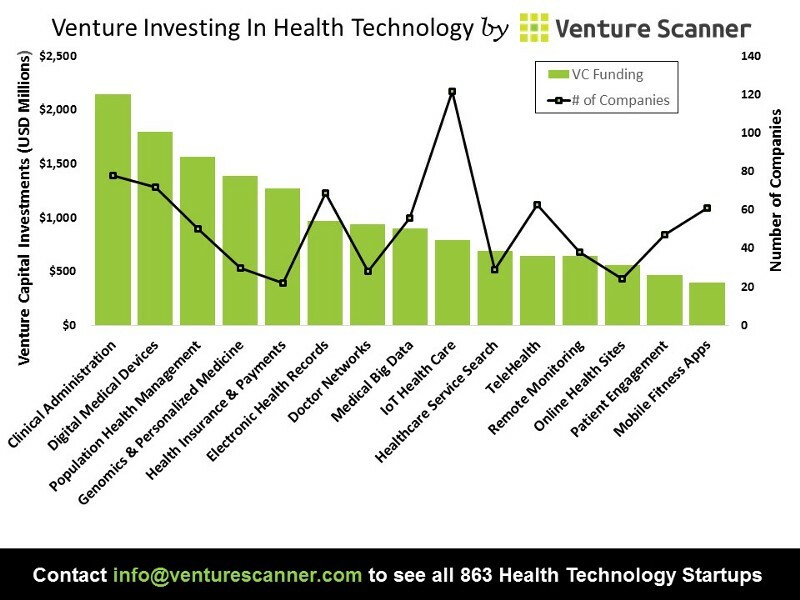 The graph above compares total venture funding in Health Technology to the number of companies in each category. The “Genomics & Personalized Medicine” and “Health Insurance/Payments” categories seem to be the ones with the most traction. The following infographic is an updated heat map indicating where Health Technology startups exist across 30 countries and 327 cities. Currently, the United States is leading the way with 706 companies. The United Kingdom is in second with 25 companies followed by Canada with 24. The bar graph above summarizes Health Technology by median age of category. The “Electronic Health Records” category has the highest median age at 9 years, followed by “Clinical Admisnitration” and “Online Health Destination Sites” at 8 years. As Health Technology continues to develop, so too will its moving parts. We hope this post provides some big picture clarity on this booming industry.